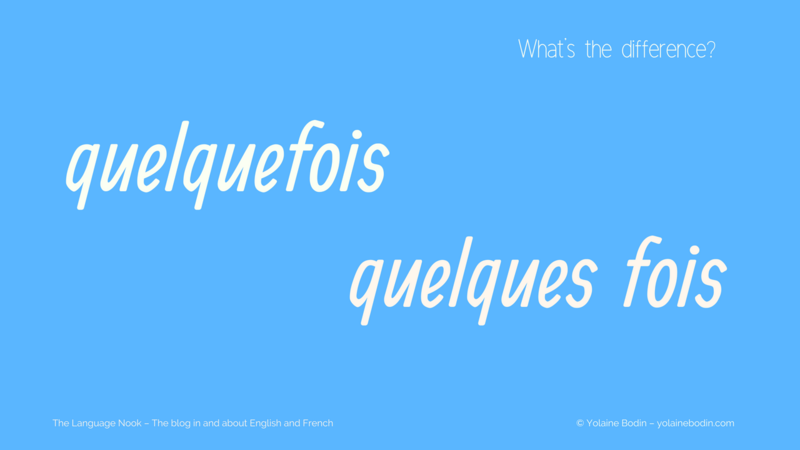 Quelquefois and quelques fois: what’s the difference? Quelquefois and quelques fois : What’s the difference? When you hear the French say quelquefois and quelques fois, you will notice the pronunciation is exactly the same. However, if you see those words in a text when reading in French, you may wonder what the difference is. Also, if you are writing, you need to spell them correctly. All you need is make sure you understand the difference between quelquefois –without an s and in one word– and quelques fois –with an s at the end of quelques et in two separate words–. Quelquefois, in one word, is an adverb. Most of the time, it is used with a verb and is a synonym of the adverb parfois (i.e. “sometimes”). See it as a frequency word that describes a degree of frequency somewhere between always and never. Il est allé à l’étranger quelques fois seulement. (He’s been abroad a few times only). That’s all! Remember both quelquefois and quelques fois are pronounced the same way, but as usual in a conversation, the context will help you understand which one the speaker is using. French spelling: ‘sans’ + singular or plural noun? “En fait” or “Au fait”? French spelling: le plus, le moins de choses possible or possibles?